With the dawn of https://3dprinting.stackexchange.com/, I thought we should (re-)evaluate if questions about 3D printing are on topic here on robotics.SE. How do I calculate the inverse kinematics of a delta printer? What PID settings will allow a smoother movement of this 3D printer axis? In what orientation should I slice this holder for a robot arm servo? 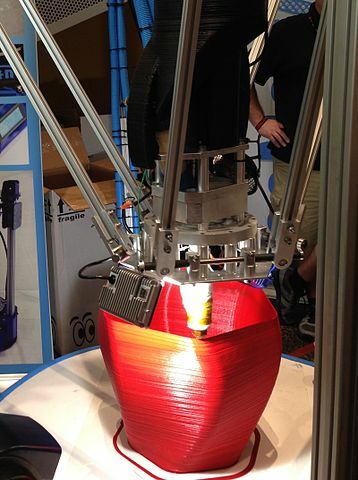 How long will it take to print this robot arm? When the last 3d printing proposal failed, I suggested that 3d printer questions would generally be welcomed here on robotics if there was no other stack exchange site which was more appropriate. If the current 3d printer site fails to get into public beta, I will do likewise. Currently though, it is going well. It still has a way to go before it meets minimum standards for a public site, but we are hopeful. Remember that even in private beta, existing private beta members can invite additional experts to join the private beta. So if you are a 3d printer expert who missed out on committing to the proposal before it went into private beta and would like to join, you just have to ask. Otherwise, as Andrew♦ said in his answer to How do we address questions about related subject areas? fundamentally, as long as it is on-topic here, no matter how on-topic it would be elsewhere, then here is fair enough. How do we address questions about related subject areas? What level of technical detail is appropriate and on-topic for this site? Should we allow legal questions?